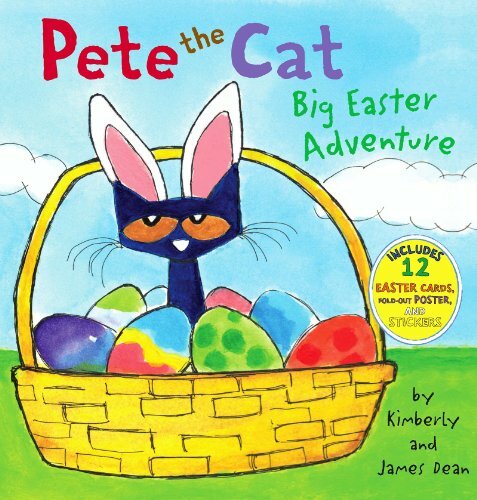 Join Pete in New York Times bestselling author James Dean's Pete the Cat picture book series as Pete has a groovy Easter adventure. In this latest Pete Picture Book, Pete helps out the Easter Bunny! Fans of Pete the Cat: I Love My White Shoes, Pete the Cat and His Four Groovy Buttons, Pete the Cat: Rocking in My School Shoes, and Pete the Cat Saves Christmas will love this Easter-themed Pete storybook. SusanSiegismund (Grade: A+) Cute little story and the books comes with tear-out cards and a poster.